Gum disease if left untreated can lead to loss of your teeth. An early sign of gum disease is continuing bleeding gums when brushing or flossing. 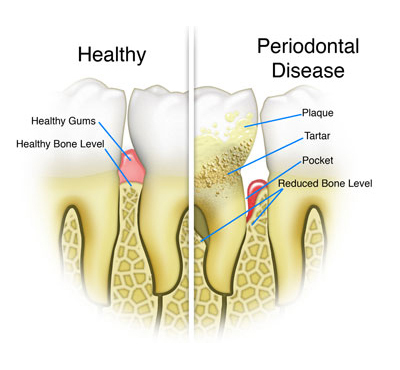 In around 20% of the population, gum disease can lead to loss of the bone that supports the teeth and then eventual loss of the teeth themselves (periodontal disease). As the main cause of gum disease is bacteria in the plaque and tartar around the teeth, the most important step in preventing gum disease is cleaning the teeth thoroughly. At Green Arbor Dental Practice, our dentists and hygienists will teach you how to clean all the surfaces of your teeth effectively to remove these bacteria. As smoking is also a contributing cause of gum disease, we can also help provide smoking cessation advice. If you already have bone loss due to gum disease, a course of treatment for eliminating the gum disease will be necessary, involving removal of all bacteria and tartar both above and below the tooth gum line, whilst the mouth has been numbed to make sure this is pain free. Once the gum disease has been eliminated, regular visits to the hygienist are recommended to ensure the gum disease does not occur again.